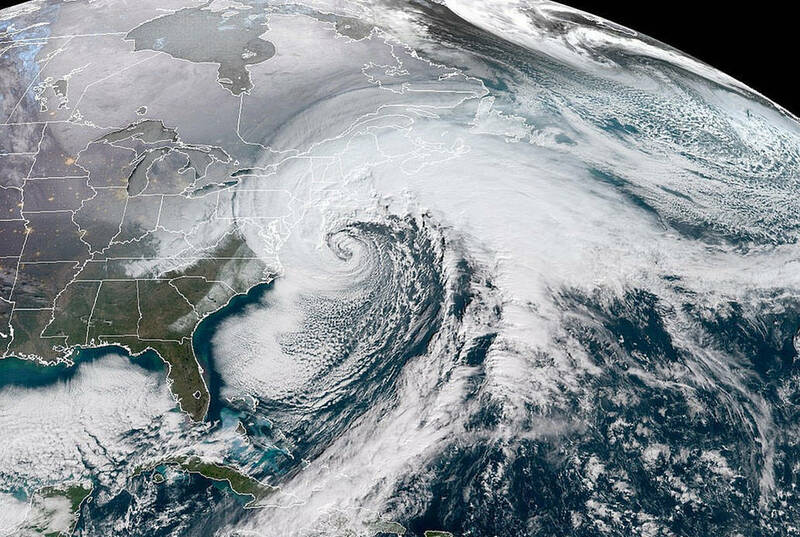 From the Daily Caller: Coal-fired power plants kept the lights on for millions of Americans during January’s bomb cyclone, according to an Energy Department report warning future plant retirements could imperil grid security. 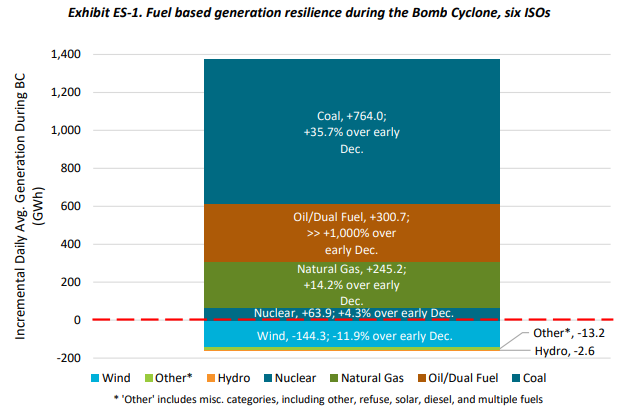 Energy analysts at DOE’s National Energy Technology Laboratory found that coal power kept the lights on for millions of Americans during the bomb cyclone that pummeled the eastern U.S. from late December to early January. RECORD cold in America has brought temperatures as low as minus 44C in North Dakota, frozen sharks in Massachusetts and iguanas falling from trees in Florida. Al Gore blames global warming, citing one scientist to the effect that this is “exactly what we should expect from the climate crisis”. Others beg to differ: Kevin Trenberth, of America’s National Centre for Atmospheric Research, insists that “winter storms are a manifestation of winter, not climate change”. Forty-five years ago a run of cold winters caused a “global cooling” scare. “A global deterioration of the climate, by order of magnitude larger than any hitherto experienced by civilised mankind, is a very real possibility and indeed may be due very soon,” read a letter to President Nixon in 1972 from two scientists reporting the views of 42 “top” colleagues. “The cooling has natural causes and falls within the rank of the processes which caused the last ice age.” The administration replied that it was “seized of the matter”. In the years that followed, newspapers, magazines and television documentaries spoke of the coming ice age. The CIA reported a “growing consensus among leading climatologists that the world is undergoing a cooling trend”. This alarm about global cooling is largely been forgotten, but it has not entirely gone away. Valentina Zharkova of Northumbria University has suggested that a quiescent sun presages another Little Ice Age like that of 1300-1850. I’m not persuaded. Yet the argument that the world is slowly slipping back into a proper ice age after 10,000 years of balmy warmth is in essence true. Most interglacial periods, or times without large ice sheets, last about that long, and ice cores from Greenland show that each of the past three millennia was cooler than the one before. The oldest explanation for the coming and going of ice was based on carbon dioxide. In 1895 the Swede Svante Arrhenius, one of the scientists who first championed the greenhouse theory, suggested that the ice retreated because carbon dioxide levels rose, and advanced because they fell. If this were true, then industrial emissions could head off the next ice age. There is indeed a correlation in the ice cores between temperature and carbon dioxide, but inconveniently it is the wrong way round: carbon dioxide follows rather than leads temperature downward when the ice returns. A Serbian named Milutin Milankovich, writing in 1941, argued that ice ages and interglacials were instead caused by changes in the orbit of the Earth around the sun. These changes, known as eccentricity, obliquity and precession, sometimes combined to increase the relative warmth of northern hemisphere summers, melting ice caps in North America and Eurasia and spreading warmth worldwide. Planes wait at the gates outside terminal five at New York’s John F. Kennedy International Airport in the heavy snow. IN 1976 Nicholas Shackleton, a Cambridge physicist, and his colleagues published evidence from deep-sea cores of cycles in the warming and cooling of the Earth over the past half million years which fitted Milankovich’s orbital wobbles. Precession, which decides whether the Earth is closer to the sun in July or in January, is on a 23,000-year cycle; obliquity, which decides how tilted the axis of the Earth is and therefore how warm the summer is, is on a 41,000-year cycle; and eccentricity, which decides how rounded or elongated the Earth’s orbit is and therefore how close to the sun the planet gets, is on a 100,000-year cycle. When these combine to make a “great summer” in the north, the ice caps shrink. The argument goes like this. Colder oceans evaporate less moisture and rainfall decreases. At the depth of the last ice age, Africa suffered long mega-droughts; only small pockets of rainforest remained. Crucially, the longer an ice age lasts, the more carbon dioxide is dissolved in the cold oceans. When the level of carbon dioxide in the atmosphere drops below 200 parts per million (0.02 per cent), plants struggle to grow at all, especially at high altitudes. Deserts expand. Dust storms grow more frequent and larger. In the Antarctic ice cores, dust increased markedly whenever carbon dioxide levels went below 200 ppm. The dust would have begun to accumulate on the ice caps, especially those of Eurasia and North America, which were close to deserts. Next time a Milankovich great summer came along, and the ice caps began to melt, the ice would have grown dirtier and dirtier, years of deposited dust coming together as the ice shrank. The darker ice would have absorbed more heat from the sun and a runaway process of collapsing ice caps would have begun. All of human civilisation happened in an interglacial period, with a relatively stable climate, plentiful rainfall and high enough levels of carbon dioxide to allow the vigorous growth of plants. Agriculture was probably impossible before then, and without its hugely expanded energy supply, none of the subsequent flowering of human culture would have happened. That interglacial will end. Today the northern summer sunshine is again slightly weaker than the southern. In a few tens of thousands of years, our descendants will probably be struggling with volatile weather, dust storms and air that cannot support many crops. But that is a very long way off, and by then technology should be more advanced, unless we prevent it developing. The key will be energy. With plentiful and cheap energy our successors could thrive even in a future ice age, growing crops, watering deserts, maintaining rainforests and even melting ice caps.